In the show Aidan Dooley awakens a forgotten Ôgreat’ in Irish history. O’Sullivan Beara was the last Rebel left standing against the Crown after the Battle of Kinsale in 1601. Using Celtic myths, an original score and brilliant storytelling, Aidan tells the true tale of how this heroic leader of the people of Beara tried valiantly to save his Clan against the vicious onslaught of the angry Tudor Queen Elizabeth, intent on ensuring Ireland would never aid the Spanish again. In doing so she destroyed the last embers of Gaelic governed Ireland. Emer O’Kelly of The Sunday Independent said of the show: “As an author, Dooley’s heart is on his sleeve; as an actor it is used with craft and skill. And the combination is pretty much irresistible” and “In Ireland we like our Heroes tragic and Dooley gives our preference full and magnificent measure in his telling of O’Sullivan Beara’s last years. Audiences won’t be disappointed”. 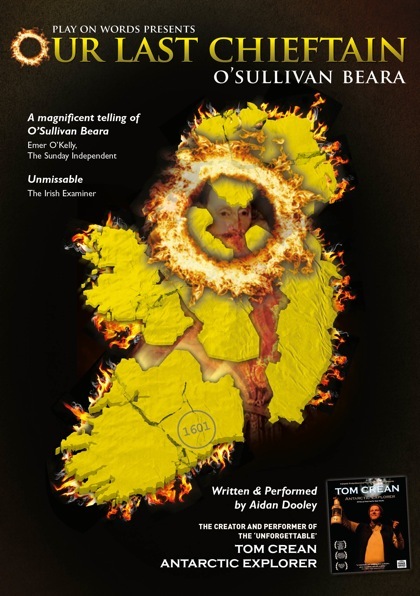 Described as “unmissable” by the Irish Examiner.